Welcome to Antiques & Moore! This listing is for a FABULOUS Mt. 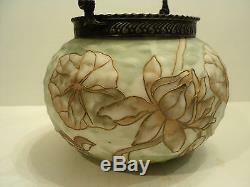 Washington CROWN MILANO Art Glass cracker jar or biscuit barrel in the "Lotus Flower" design. Measures 5 1/4" high to top of lid and 9" to the top of the handle. 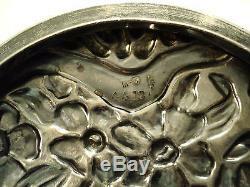 The silver plate collar has an embossed decorative rim attached to the base. The handle is unusual with an elaborate design and the hinges operate smoothly. 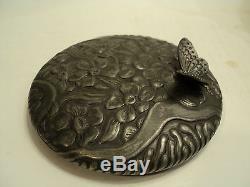 The lid has an embossed floral design in high relief with a butterfly finial. 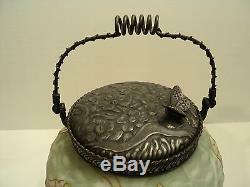 There is no damage or repair on the silver plate collar, handle or lid. 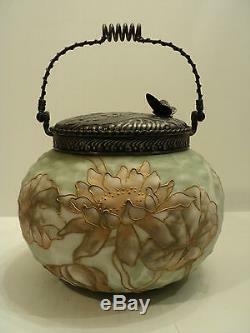 The body of the cracker jar is made of opaque opal glass which Mt Washington is known for, however, this piece is also signed with the acid etched "C M" Crown stamp. It is beautifully decorated with flowers in soft shades of beige and gold on a soft pale green and cream matte finish background. 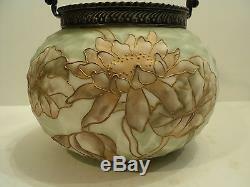 The body of the cracker jar is in excellent condition with no chips, cracks or repairs. 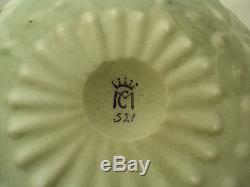 Crown Milano glass was o riginally called "Albertine" with the patent for this Art Glass being issued in 1893. The name was later changed in the Mt. Washington factory records to "Crown Milano". 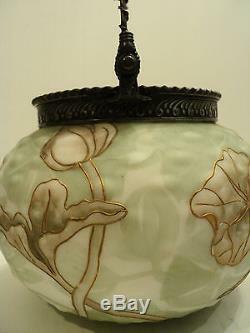 Crown Milano glass is scarce and generally only found in prominent Art Glass collections. 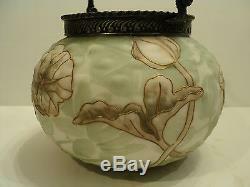 This stunning cracker jar is a fabulous example of this RARE and collectible Art Glass. Pictured on page 102 in Mt. Washington Art Glass Identification & Value Guide book by Betty B. A flexible layaway plan is available for any of our special items. We at Antiques & Moore have been in the Antiques business for over 30 years and try to describe our items as accurately as possible. We are happy to answer any questions and always appreciate your business! 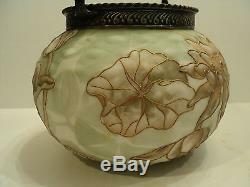 WASHINGTON CROWN MILANO ART GLASS CRACKER JAR / BISCUIT BARREL" is in sale since Wednesday, February 18, 2015. 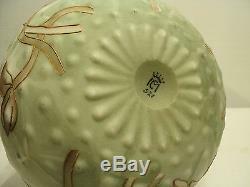 This item is in the category "Pottery & Glass\Glass\Art Glass\North American\Pairpoint/Mt. 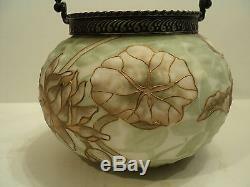 The seller is "antiquesandmooresales" and is located in Hendersonville, North Carolina. This item can be shipped worldwide.